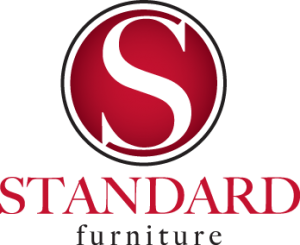 For items from Standard Furniture, visit Heavner Furniture Market, the Raleigh and Smithfield dealer of quality Standard furniture. In an effort to give our customers the best home furnishings available at the lowest prices possible, we regularly restock our inventory with Standard Furniture. To experience the quality of Standard Furniture and find a unique item for your home, visit us in Raleigh on Glenwood Avenue or in Smithfield on West Market Street today! Our inventory of Standard Furniture items is always changing. Giving our customers as much variety as possible when they shop is a central goal of ours. When you visit one of our two showrooms, you will see thousands and thousands of unique items that you can’t be found anywhere else. To find a specific kind of Standard Furniture bed frame, please speak to a member of our helpful customer support staff. We will be happy to assist you in finding exactly what you’re looking for. As we are constantly buying new products, you are guaranteed to find the latest styles and materials in our showrooms. The best part is that you will pay less at Heavner than you will anywhere else for Standard Furniture. We acquire all of our inventory via national furniture shows, through imports direct from manufacturers, as factory closeouts, or special purchases. This means that we are able to get you the same great items from Standard Furniture that you love, for a fraction of the retail price. To learn more about our products our delivery policies, call us in Raleigh at (919) 881-9200 or in Smithfield at (919) 934-0551. You can also complete a brief contact form. We look forward to bringing you the beautiful home furnishings you’ve always wanted!